Thirty seconds. It takes less than that, actually, to turn the 2010 Volkswagen Eos from a hardtop to a fun and sporty convertible. Fun's the operative word here: It's been the first word most owners use when talking about the car since VW first introduced it in 2007. Not a lot has changed for 2010. Volkswagen has cut back and now offers only two trims in the Eos, the Komfort and the Lux. Both come with a 2.0-liter, 200-hp, turbocharged four-cylinder with 207 lb-ft of torque. The Komfort is rated at 21 mpg for city driving, 31 highway, and the Lux rates 22/29. VW is no longer putting out the VR6 with its V6. A six-speed manual is standard in the Komfort, and a six-speed automatic with Tiptronic is available. The Lux comes with the automatic. Both trims have new touches, with a leather-wrapped steering wheel, shift knob, and brake handle. Bluetooth hands-free calling with voice control, a tire pressure monitoring system, satellite radio and an eight-speaker sound system, a trip computer, and an eight-way adjustable passenger seat with lumbar support are other features standard in both trims. A navigational system is optional for both. Upgrades in the Lux include 12-way power-adjustable seats, a multi-functional steering wheel, and 17-inch Sienna alloy wheels. The Eos, with its braking, traction, and stability control, along with airbags and a rollbar designed to deploy in a rollover, have consistently scored well in safety tests. Still, it all comes back to the easy-to-use convertible - to be precise, VW says the power roof retracts in 25 seconds - in a car that generally gets good reviews from pros and owners alike in handling and especially its fun-and-sun factor. No need to despair when it's too cool or wet outside to have the top down, either: The hardtop has a sunroof in it. The experts also like the space up front. Space in the back and the trunk? Not so much. That hard top takes up some room, after all. If your carpool includes a couple of adults in the back on a regular basis, this might not be the car for you. If you have the school route, though, the kids - including the big kids up front - will love it. What's your take on the 2010 Volkswagen Eos? 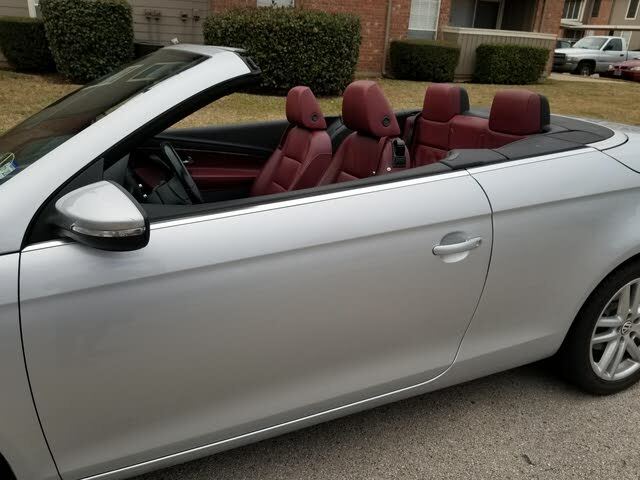 Have you driven a 2010 Volkswagen Eos? Unable To Charge My Phone. Both A/C Outlets Not Working.